Browse the latest Fiesta Weekly Ad, valid April 17 – April 23, 2019. Save with this week Fiesta Ad specials, printable coupons and bakery & deli savings & promotions. Great savings on: Ensueno Fabric Softener; Assorted Pork Chops; Roma Tomatoes; Tropicana Pure Premium Orange Juice; El Charro Salvadorena or Mexicana Cheese; Blue Bunny Ice Cream; Lone Star Legacy Beef Sirloin Steak, La Vaquita Fresh Cheese, Louisiana Medium Crawfish, Texas Gulf Wild Catch Shrimp, Mangos, TRESemme Shampoo or Conditioner, McCormick Mayonesa, Chilean Whole Mussels. 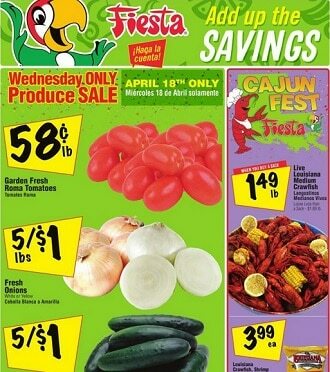 Don’t miss this week Fiesta Mart ad deals and don’t forget to print off your coupons before heading out to shop.